Notre Dame drove down to West LaFayette, Indiana for the final race of the regular season hosted by Purdue. The weekend was filled with close finishes, a few crashes, and fierce competition between Notre Dame and our D2 rival-Case Western Reserve University. The Irish fought hard all weekend and managed to defeat CWRU for the D2 team omnium championship by a mere 15 points. This is the 6th year in a row that the Irish won the Conference championship for D2. Everyone who raced this year earned us at least 15 points, so we literally could not have won without any member of the team. Thank you to our sponsors for helping us out so much this season! We could not have done it without your generosity! Men’s D TTT (Ryan Green, Cole Carnesecca, John Cerney, Laura McMillion) – 2nd! On May 13-15th, Sarah Cullen, James Pratt and Tony Pratt will be going to Asheville, NC for Collegiate Road Nationals! The Irish traveled down to St. Charles, MO for a weekend of great weather and ok racing. The Irish ran out of luck, as one team member, Laura, suffered a bad crash during the road race. There were some highlights and everyone was glad to race in shorts and short sleeves for the first time this season. Notre Dame had two team time trials. The Men’s C TTT, which included John Cerney, Anthony Hall, and Charles Hall came in third. The Men’s A TTT, consisting of Cole Carnesecca, David McKenna and James Pratt finished in last, but were taking it easy and just wanted to get a few points knowing they would not place well with only 3 racers and only one A racer. In the Men’s D 22 mile road race Cole and John C finished 30th and 31st. John stopped to help Laura (see below) after her crash. Many riders dropped out of the race, so the Irish were proud to finish the very difficult course. In the Men’s C road race, a break of 3 formed quickly on the first hill, and Charles was in a chase group of 7. They were unable to catch the break, but Charles finished the race in 6th place after long 44 miles. In the women’s B/C, Laura McMillion was the a group of 3 riders chasing a one woman breakaway, but she lost focus for a second because of the heat and ended up crashing and suffering a sprained shoulder and had to have 7 stitches in her forehead. Laura was in good spirits after the crash and luckily her parents were there to help take care of her. In the Men’s 88 mile A race, James Pratt stayed with the pack for the entire first lap. Even though he got dropped after that, James was determined to finish. James ended up finishing all 88 miles and came in 25th place! In the women’s A race, the field got separated on the second hill of the first lap. Sarah was in the third group of riders but managed to catch up to and eventually drop some of the riders in front of her. On the last lap, Sarah was with two other riders but her derailleur was not working properly and her chain got jammed on the last major hill. Sarah stopped to put the chain back on, and rode the final (flat) 10 miles of the race using only one gear. Sarah came in 8th place, her best A finish to date. David McKenna (Men’s B) and Anthony Hall (Men’s C) were both unable to finish the road race. On Sunday, Charles Hall had the best finish of the day in the men’s C race with 11th place. Charles was in the lead group, but Wisconsin had 6 riders and were able to control the field. David McKenna worked hard to pick up primes in the Men’s B race, and finished the race in 16th place. All other ND riders were so worn out from the road races that they were pulled prior to the end of their crits but were still scored. In the Men’s D race, Cole was placed 28th and John 20th. In Men’s A, James was placed 42nd, and in Women’s A Sarah was placed 15th. Please pray for a speedy recovery for Laura McMillion. As of Thursday, she is feeling much better and excited to be possibly able to race at Purdue this coming weekend! Heading into the final weekend of regular season racing, Notre Dame is ranked #3 in the conference (#1 among D2 teams!). Tony is ranked #1 in the D2 Omnium and James Pratt is #2. Sarah is ranked #3 in the Women’s A D2 Omnium. David is #3 in Men’s B D2 and Laura McMillion is #1 in Women’s B D2. Notre Dame made the drive up to Michigan for the MSU/UofM race weekend April 2nd-3rd. Not surprisingly, the weather was terrible with blizzards and wind Saturday and below freezing temperatures on Sunday. Despite a bit of complaining, the weather did not stop the Irish from having another successful weekend. On Saturday, the road race and individual time trial were held in Laingsburg, Michigan and were hosted by Michigan State University. The road race had sections of dirt roads with many potholes. Blizzards struck at the end of the Men’s A and B and Women’s A races, causing the dirt to turn to mud making the race even more difficult. Tony Pratt finished in 3rd place after making a breakaway earlier in the race. Due to confusion about passing the lead vehicle at the end of the race, some riders went ahead for the final sprint while Tony stayed behind the lead car. Because of the confusion, Tony received first place points, but having crossed the line third, he accepted 3rd place in the rankings. James Pratt suffered a flat tire and was unable to complete the race. David McKenna had a good race and finished in 12th place. He also helped a fellow competitor from Purdue who had mechanical issues throughout the race! Charles and Anthony Hall competed in the Men’s C race. Charles crashed on the first lap, but was able to eventually catch up to the peloton. Charles and Anthony finished in 16th and 17th places. Cole Carnesecca made his Notre Dame cycling debut in the Men’s D race. Cole finished 40th. Ryan Green missed the start of the race because it started earlier than it was supposed to, but was able to catch up to and pass several riders and work his way up to 29th place. Sarah Cullen made her women’s A debut at MSU. The field was split up on the first lap, but Sarah was able to catch up to riders to work with. Sarah finished in 10th place. Paige Handy and Laura McMillion represented Notre Dame in the women’s B road race. Most of the group stayed together for the entire race and in the final sprint, Paige came in 4th and Laura came in 5th. Following the road races, the Irish competed in the 7 mile individual time trial. Next weekend is the home race!! Get pumped! On March 19th and 20th, the Irish headed back down to Columbia, Kentucky for another great weekend racing at Lindsey Wilson College. The team was well rested and recovered from Spring Break and had a number of best finishes and impressive performances. Races started Saturday morning with the Irish competing in three Team Time Trials. The Men’s A TTT consisting of David McKenna, James Pratt, and Tony Pratt finished 5th overall. The Men’s C team included Anthony Hall, Charles Hall, Connor Williams, and Ryan Green. They finished 3rd out of 10 teams competing in the C category. Finally, the Women’s B/C team of Kelly Valenzi, Laura McMillion, Paige Handy, and Sarah Cullen won their category, continuing their undefeated streak from last year in the women’s B/Cs. Next up were the road races. The course was 25 miles long with over 1400 feet of climbing each lap. Men’s D and women’s B/Cs did one lap, Men’s C and B did two laps, and Men’s A did 3 laps. In the Men’s D race, Charles Hall had his first podium finish with a 3rd place. Anthony Hall finished 11th, and Ryan Green finished 25th. Pete Freeman made his Notre Dame cycling Debut in the road race and finished 31st overall. Connor Williams had an outstanding performance in his first race back after breaking his foot. He stayed in the breakaway group and finished the 50 mile men’s C race in 6th place. David McKenna was the only men’s B racer, and he finished the 50 mile race in 15th place. The women’s B/C field split up within the first 5 miles. A rider from Iowa attacked on the first big hill, and Sarah C chased for two miles and eventually managed to catch up. Meanwhile, another chase group including Paige and Laura formed behind them, and Kelly was in another group behind that. Sarah ended up taking second place. Laura came in just a few minutes after in 4th, and Paige finished right after in 6th. Kelly also had a good race and came in 10th place. After being dropped, James and Tony stopped racing after the second lap of the Men’s A road race. On Sunday, the Irish had many more great finishes in the criterium. Charles Hall earned his first and the team’s second win of the season by coming in first place in the Men’s D crit. Anthony Hall earned his first top 10 spot, coming in 9th place out of 33 racers. In the women’s B/C crit, there were multiple attempted attacks. None stuck, but each shredded a few more riders off of the back. At the end, all four Notre Dame women were in the remaining group of about 10 riders at the final sprint. Sarah came in 2nd, Laura 4th, Paige 6th, and Kelly came in 8th. David McKenna represented Notre Dame in the men’s B race. David held on to stay in the front group, and finished 8th overall in a very fast race. In the last race of the day, the Men’s A crit, James and Tony Pratt had great performances. Both Tony and James stuck in the pack the entire race, and Tony finished 13th, while James was right behind in 16th in a field of 40. 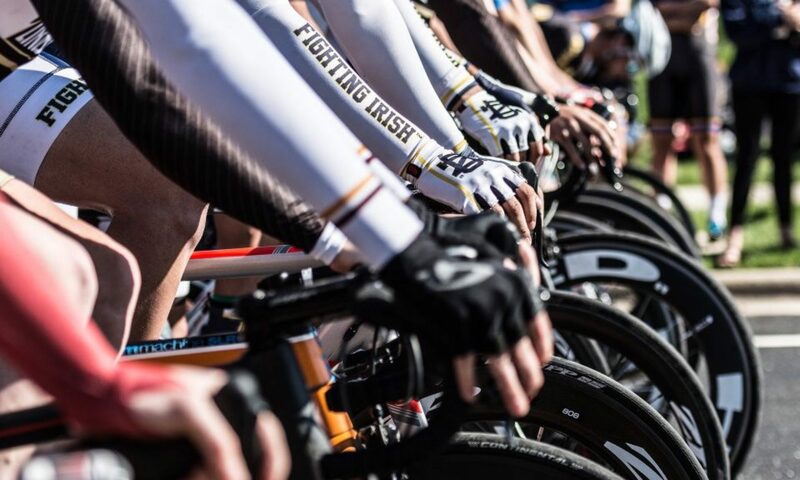 On April 2nd and 3rd the Cycling Irish will be heading North to Michigan State and the University of Michigan for another fun weekend of bikes! The Irish started off the 2016 season in Louisville, Kentucky with the Cardinal Crit on March 12th. The team had a strong first showing and besides a small amount of rain, the day was warm and pleasant. Even though they were tired from the Spring training trip, the Irish had several outstanding performances. The day of racing started off with the men’s D race. Charles and Anthony Hall made their Notre Dame cycling debut and both finished in the top half of the field. Charles finished in 24th, while Anthony was right behind in 26th. Returning riders in the men’s D included David Berno (32nd), Ryan Green (46th), and Joe Mueller (47th). The women’s B/C raced next, and started the season exactly how they ended it last year-with a win. Laura McMillion surprised everyone by sprinting out of the middle of the pack to win her first race ever! Sarah Cullen was right behind Laura, coming in second, and Kelly Valenzi finished in fourth. The Irish women are working on gaining upgrade points to move up to the A category, and it would appear that they will be able to move up soon. Andrew Koch and David McKenna raced in the men’s B. David picked up a prime during the race, scoring extra points for the Irish. McKenna finished the race in 13th, right behind Andrew Koch who came in 12th. The final race of the day was the men’s A race. Freshman Tony Pratt made his ND cycling debut, and his older brother James Pratt raced A’s for the first time. Tony came in 27th, and James finished 45th. Overall, this was a great start to the season, and we can expect even better results next weekend at Lindsey Wilson after the Irish have had more time to recover from Spring training.